An intense and suspenseful spy adventure. 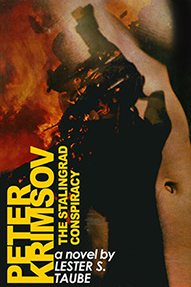 All readers of spy fiction who have been existing in a partial vacuum since the last James Bond story can now step into the exhilarating atmosphere of a new kind of intense and suspenseful spy adventure by meeting Peter Krimsov. When Major Peter Krimsov, a former language professor, is sent on a mission behind German lines at Stalingrad, he overhears a plot by a Russian general to defect to the Nazis. He is promptly assigned to the ultra-secret State Security Department, and ordered to uncover the Russian traitor. But Krimsov has a more urgent reason to find the traitor. To conceal the meeting, a nearby village has been wiped out by Nazi extermination squads. Raped and murdered in that village was Krimsov’s pregnant wife. His first assignment is to track down Karl von Bringler, the sole German general still alive who attended the meeting, but who has disappeared. Krimsov’s travels take him throughout Europe and finally to Argentina in search of Pilar, the beautiful mistress of the missing German. Ruthless and deadly, both as a man hunter and lover, he uses Pilar as his bait to corner von Bringler for a confrontation. The irony of the search is that Krimsov himself also falls in love with the designing woman. Returning to Russia with his explosive secret, shattered in body and close to death, he must unravel the final threads of the massive plot that reaches to the very pinnacle of his government.